The graphics card software is usually the best place to start within Windows. “Right Click” on the desktop, go to “Graphics Settings”, then “Panel Fit”, and “Center Image”. 1 – “Right Click” on the desktop. 2 – Select “Display Settings”. 3 – Navigate to “Resolution”. 4 – Change the “Resolution” to where it says (Recommended). 5 – If screen is not centered, try different “Resolution” settings. 2 – Select the “Video Driver” such as Nvidia or Intel GMA. 5 – Move the “Arrows” around until the screen is centered. 6 – Click “Apply Settings” and “OK”. 2 – Click “Intel Graphics Settings”. 4 – Navigate to “Resolution”. 5 – Change “Resolution” until screen centers. 6 – Also check “Scaling” and be sure it is set correctly. 7 – After choosing the settings, click “Apply”. 4 – Set the “Orientation” to “Landscape”. 2 – Select “HP My Display”. 3 – Go to “Options”. NOTE: If you cannot find “Control Panel”, go to bottom left of the desktop screen and select “Settings”. In the search bar simply type “Control Panel” and select it. Once in the “Control Panel”, select “Appearance and Personalization”. There will be a “Video Driver” icon/shortcut. Click the “Video Driver” and change the settings until screen centers. 1 – Reinstall the video driver to be sure you are up to date. 2 – Check video card resolution and set to native resolution. 3 – Change video card resolution if different settings are needed. 1 – Power down the laptop. 2 – Power the laptop ON and press the F10 key repeatedly so the BIOS loads. 3 – Once the BIOS screen appears press the F10 key to load the BIOS default settings. 4 – Save and then exit the changes. 5 – Let Windows load normally. 6 – Check the display to be sure it is centered. 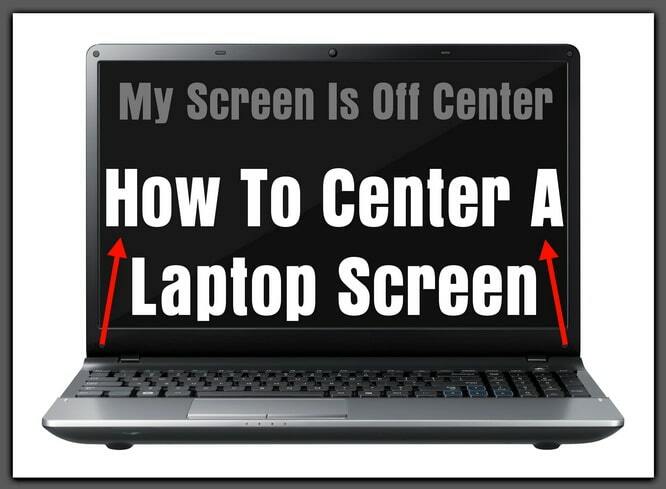 Still having problems getting your laptop screen to center? Please let us know by using the comment form below. Let us know what version of Windows you are using and we can help assist you in fixing your laptop. While still holding power on button, plug printer in and continue holding button for another minute after plugged in, release button. This may help.